VOICE LESSON: Do They Really Help? In my years of teaching voice, I’ve worked with teachers, lawyers, politicians, speakers, singers, business executives, media professionals, American Idol contestants, and even stay-at-home moms, all experiencing voice problems caused by straining their voices as they tried to be heard above life’s boisterous noise and chatter. I understand their frustrations because I also lost my voice at a pivotal time in my life, and that catastrophe almost ended my singing and acting career just as it was about to take off. I was twenty years old, singing in Las Vegas with the world by the tail when my voice problems began. I had just been booked as an opening act for Elvis (the real one! ), and I had wonderful opportunities flying at me from all directions and a secret fear—that I could not trust my voice to be there when I needed it most! This fear kept me from acting on any of them, and like most people with voice problems, I just kept pushing my poor, abused voice by tightening, forcing, and strangling it into submission. In my ignorance, I actually believed that I could make my voice perform by pushing it harder and forcing it to be louder. The frustrating result of all that pushing was when I pushed it too hard, my voice would wisely say, “Enough is enough, Joni,” and completely shut down. I had to cancel gig after gig and miss opportunity after opportunity because I had no voice. Fortunately, I didn't take his advice. But it wasn’t until I became a voice teacher 20+ years ago that I realized this problem was not mine alone. I knew there had to be an answer, not only for me but for everyone whose career depends on a strong voice that has to last for more than a few hours, even if you are overworked and tired. Rosemarie: I know exactly what you mean Joni, I've had that same problem. Joni: Well, I've spent the last 20+ years watching the answers to MY Own Voice Problems unfold before me, student by student and lesson by lesson. Each person became a link in a chain of events that, I’m happy to say, completely resolved my voice problems as well as those of my clients and students. YES, Rosemarie! My never-ending search for answers paid off because today my voice is stronger than ever. So, here (at last) is my answer to your question! Knowing that your voice will be there when you need it most eliminates fear and builds the self-trust so essential for a singer, speaker or business executive to be successful. I have witnessed shy, soft-spoken students perform minor miracles once they learned how to use their voices properly. Sharing this important information is the reason I teach voice, write books and speak to anyone who will listen on the importance of using good voice technique, and that's my answer to the "naysayers and the skeptics" who tell you voice lessons are a waste of time. When it comes to voice lessons, One Size Does Not Fit All. If you sing pop style, classical training is not for you. If your goal is to sing at the Met, pop training is not for you. Country is not the same style as R&B and American Idol auditions are not the same as your musical theater auditions. In other words singing styles are as unique as playing any musical style on any instrument. The good news is: When YOU know how to play YOUR own unique vocal instrument correctly, style is just that. . . style. Voice lessons are supposed to teach YOU how to play YOUR vocal instrument so YOU can decide what style of singing YOU choose. Can you sing more than one style? Of course, just like a piano is not limited to playing Salsa, once you learn how to play your vocal instrument you can sing many styles. The keywords here are: "Learn to play your instrument.”, and that takes the guidance of a good voice trainer because you can NOT hear your voice like others hear your voice. Rosemarie: Why can't I rear my own voice? Joni: I love that question. The answer is simple; it's because of the resonating chambers in your head. The truth is, you are hearing 65% more sound in your head than we are hearing coming out of your mouth. And if you don't believe that, just record your voice and see if that voice sounds the same as the one you are hearing in your head. Singing or speaking, a well-trained set of "3rd party ears" can teach you how to hear your voice and correct any voice problems you may not even be aware of. Rosemarie: So what is your advice to performers of any age regarding voice lessons? Joni: Good voice training can be a blessing because your voice can make or break your career, period! Your voice is the most amazing, God created, instrument on this planet and it is mechanical. I said in the beginning of this interview that voice problems are NOT random events. There is always a cause attached to the effect and a good voice coach can help you find the cause and solve the problem so surgery and medications are your last result. Please to keep your voice healthy so it will last your lifetime, and: Take the Time to Learn How to Use your Voice Correctly. It’s Fun, it’s Easy and it will give Your Life and Your Career a Huge Jump-Start. 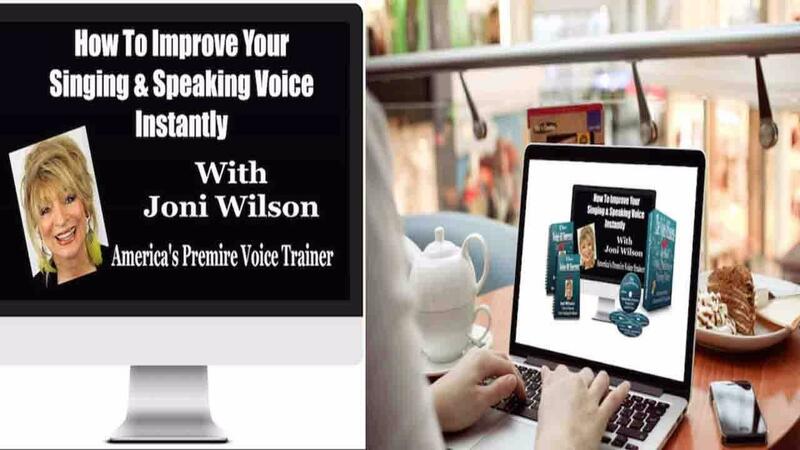 If your readers will go to my website @ www.3dimensionalvoice.com and give me their e-mail addresses, I would love to send them a free copy of my e-book: Creating a Voice That Lasts a Lifetime or they can visit my site @www.joniwilsonvoice.com for more information. 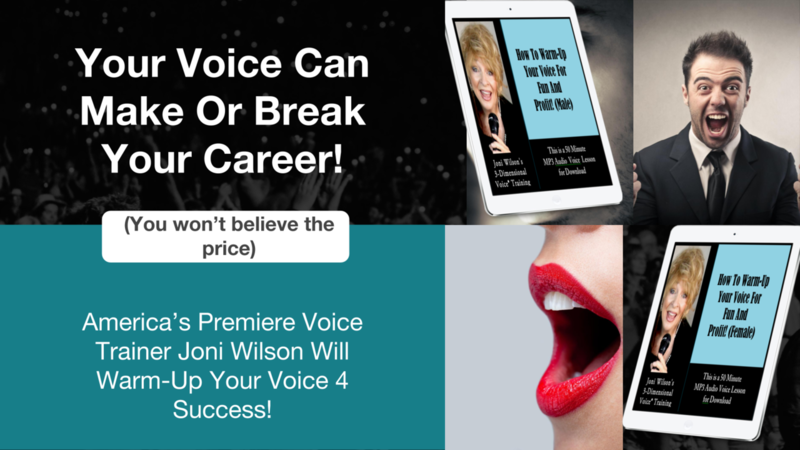 Joni Wilson is an internationally recognized voice expert, singer, professional speaker, and bestselling author with over 20 years experience training both singing and speaking voices. Her clients include top executives and 2 American Idol, and one The Voice finalists. She is the creator of the amazing 3-Dimensional Voice® Training System, a cutting-edge voice method so effective it is changing the lives of speakers, entertainers and business professionals all over the world. 4 of her voice books have reached the #1 position on amazon. Joni's mission in life is to prove to her clients that the human voice is "ageless' and to teach them how to actually LOVE the sound of their own voices.